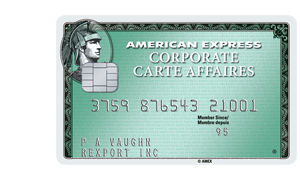 The American Express Corporate Card provides convenience and support so you can focus on what matters. Your American Express Corporate Card entitles you to a range of benefits and tools from travel services to exceptional customer support. Experience a new level of rewards and convenience with the Card that works hard, so you can do business more easily. If you should need an emergency medical or legal referral while travelling on business, you can call the 24-Hour Travel Emergency Assistance. Representatives can refer you to lawyers, doctors, opticians, pharmacists and hospitals. If you unexpectedly get called to a meeting in another country, we can get you travel information fast, including visa and customs regulations or inoculation requirements. The service is included with your Card, however any resulting costs will be your responsibility. Contact info: 1-800-678-5523 in Canada and the U.S. or collect at 1-514-285-8165 when travelling abroad. Our optional Membership Rewards program allows you to earn one Membership Rewards point for virtually every dollar in purchases charged to your American Express Corporate Card. Points can be redeemed for flights and hotel stays, gift cards from the finest retailers, brand name merchandise, access to fantastic entertainment and dining rewards, and much more. Enrollment is required. To find out if you are eligible for Membership Rewards, ask your Program Administrator or call 1-800-716-6661. Annual program fee applies. Say hello to American Express Invites. It opens the door to memorable experiences we think you’ll love. It’s your table at the restaurant everyone is talking about. Your chance to get tickets to some of the hottest concerts through Front Of The Line®3. Or to reserve your seat at the next big blockbuster. It’s your invitation to the latest must-see productions. Your chance to say "I was there". To get the latest entertainment news from Front Of The Line, sign up for e-Updates or like our Facebook page for more great American Express Canada updates. Express Cash4 offers managed access to cash for travel emergencies and incidentals. If eligible, you can conveniently obtain cash for out-of-pocket business expenses using a network of more than 900,000 ATMs located in airports, hotels and shopping complexes around the world. Professional customer assistance is always just a phone call away. So whether you have billing inquires, emergency replacement Card requests or need information or access to a Card benefit or service, we’re ready and able to provide the support you need. If you need to extend a business trip by a couple of weeks or pay for unexpected business entertainment costs, no problem. The Corporate Card gives you the flexibility and confidence of having no pre-set spending limit5. Your purchases are approved based on your past spending and payment patterns, and other factors. Having signed up to Online Account Management, you can make payments, view statements, complete expense reports and manage your Membership Rewards 24/7, anywhere Internet access is available. Or, access your account on the go via the Amex mobile app. When you fully charge your airline tickets to your American Express Corporate Card, you can receive up to $500 coverage for all reasonable and necessary hotel, motel or restaurant expenses when you are delayed or denied boarding more than four hours. Or, when your baggage on your outbound trip is delayed more than six hours, you can receive up to $500 for all immediate daily necessary and reasonable emergency purchases made within four days for essential clothing and sundry items. Automatic coverage of up to $500 against the loss of most personal items (excluding cash) if your hotel or motel room is burglarized. Coverage is in effect as long as you have fully booked and paid for your accommodations with your American Express Corporate Card. Save money when traveling with complimentary Car Rental Theft and Damage Insurance. Where allowed by law, you will be automatically covered for damage or theft of your rental car with an MSRP of up to $85,000. Every time you travel for business on a common carrier (plane, train, bus or ship) and charge your tickets to the Corporate Card, you’re automatically insured with up to $500,000 in accidental death and dismemberment insurance through your Business Travel Accident Insurance coverage. If your company policy allows, use the card to book tickets for your spouse or dependent children (under age 23) and they will also be automatically covered when accompanying you on your business trip. Select Travel Plan – if you already have out-of-province emergency medical insurance and need coverage for non-medical situations such as trip cancellation and trip interruption, trip delay, baggage and personal effects as well as flight and travel accident. Ultimate Travel & Medical Plan – if you need the most comprehensive coverage with features such as out-of-province emergency medical insurance, trip cancellation insurance, trip interruption insurance, trip delay insurance, baggage and personal effects insurance, and flight and travel accident insurance. www.americanexpress.ca/travelinsurance or call the Travel Insurance Enrollment Centre at 1-866-587-1029. Program Administrators, please contact your American Express Representative or call 1-866-568-0308. Cardmembers, please contact your Program Administrator. Find important Cardmember agreements, insurance certificates and other terms and conditions. 1. Travel Emergency Assistance: All services associated with Travel Emergency Assistance are provided worldwide with the exception of some countries (it is best to check with Customer Service). In addition, services may be limited or prevented by acts of God, war, civil commotion, labour disputes, unavailability of goods and services or refusal of permissions by local authorities. 2. Membership Rewards: Earn one point for virtually every dollar charged on eligible, enrolled American Express® Corporate Cards. In the case of a Corporate Card, participation in the Membership Rewards program is subject to the approval of the Company or other entity in whose name the Corporate Card account is opened. In order to participate and before any points can be earned, the Cardmembers must first enroll in the program (except for the American Express Corporate Platinum Card which, if Company approval is given, is automatically enrolled in the Program). The Company or other entity may also cancel participation in the Program at any time. Rewards are subject to availability and restrictions may apply as to when the reward can be redeemed. Amex Bank of Canada reserves the right to terminate the program with three (3) months prior notice. Items submitted to us or recognized by our systems as being purchases or charges for travellers cheques or foreign currencies, cash advances, balance transfers, Amex Cheques, Express Cash transactions, annual fees, finance charges and/or other fees or charges are not eligible to earn points. Redeemed rewards are not refundable, exchangeable, replaceable or transferable for cash or credit. Amex Bank of Canada reserves the right to change the Program Terms and Conditions, including without limitation assignment and reassignment of tiers and associated rights, at any time without notice. To cancel enrollment in the Membership Rewards program at any time, please call 1-800-716-6661. Please visit www.membershiprewards.ca or call 1-800-716-6661 for more information, for current annual fees or for full Membership Rewards Terms and Conditions. 3. Front Of The Line: Purchase must be charged in full to an American Express Card issued by Amex Bank of Canada. Subject to availability and to event and ticketing agent terms, conditions and fees. Not all seats are available. All sales are final. No refunds. No exchanges. 4. Express Cash Service: After Company registers for this service, Cardmembers must then enroll individually with American Express. In addition, proof of identity to comply with government requirements may be required. Cardmembers will be informed via post when they have been enrolled and will be supplied with a PIN. 5. Spending Limits: American Express reserves the right to refuse to authorize any charge. Some Corporate Cards may carry specific usage guidelines and limits at the request of your company or at the discretion of American Express. † Note: All Insurance coverages are subject to the terms and conditions of their respective Master Policies. Certain limitations, exclusions and restrictions apply. Please read Certificates of Insurance carefully. 6. Flight & Baggage Delay Insurance: Underwritten by Royal & Sun Alliance Insurance Company of Canada. 7. Hotel/Motel Burglary Insurance: Underwritten by Royal & Sun Alliance Insurance Company of Canada. 8. Car Rental Theft and Damage Insurance: Underwritten by Royal & Sun Alliance Insurance Company of Canada. Coverage is in effect as long as you have fully charged your rental to your American Express Corporate Card. There are specific conditions that apply to who may rent and drive the rental vehicle, the length of the rental(s) and the type of vehicle covered. 9. Business Travel Accident Insurance: Underwritten by Chubb Insurance Group of Canada (a member company of the Chubb Group of Insurance Companies). Under Master policy #6477-4608. 10. AMEX Travel Insurance: AMEX Travel Insurance™ is optional group travel insurance underwritten by Royal & Sun Alliance Company of Canada. All insurance coverage is subject to the terms and conditions of the Group Policy issued to Amex Bank of Canada and the applicable limitations and exclusions described in the Certificate of Insurance issued upon enrollment.